The following article was copied from our recent church newsletter. So, first things first, I’m back in one piece having had the trip of a lifetime. 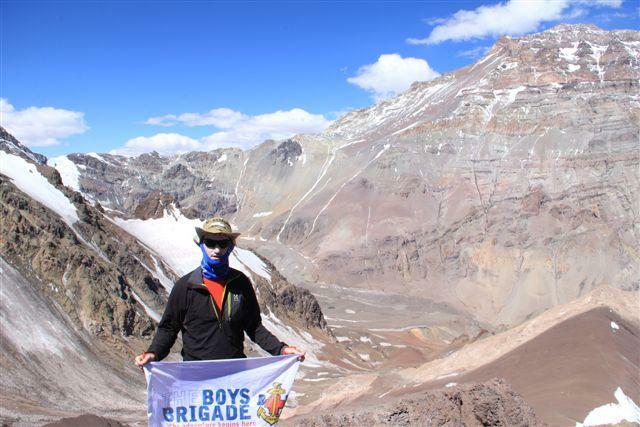 Aconcagua was more challenging than I could ever have imagined, but the mountaineering experience that I have gained will be invaluable in future. Unfortunately on this occasion the summit was just out of reach, as I made the decision to turn around in 60-80kph winds having made it to Camp 3 at 6,000 metres. Oddly enough it’s a decision that I don’t regret, because the most important thing was being there and trying to achieve something. With the support of our amazing church congregation, our fantastic BB Company and a good number of other people we’ve now raised around £1,100 for BB Scotland and it seems to keep on rising. We’ve made the Cumbernauld News, and I’ve had countless messages of support (including a fantastic card from Catriona). I called my 7 Summits Project ‘Engage a Generation’ at the outset, and it appears the engagement is exactly what we’re getting. I’ve been humbled by how it’s all taken off. So, what next? Well I’ll have to go back to Argentina, but first I’m off to Russia to climb Mount Elbrus (keep your eyes peeled, as you may see it on the BBC during the Winter Olympics)… I’m also working my way round various BB Companies doing presentations on the project, and we’re trying to set up some Scotland-based events to get people participating in things, so it’s an exciting time. I do just want to emphasise though how grateful I am to all of you for your love and support. It was never going to be easy, but when I sometimes wonder whether it’s worth it, it’s great to look at all the people who’ve sent a message or made a donation. Thank you, you’re helping to make a huge difference to the lives of young people. Together I really do believe that we can ‘Engage a Generation’. As far as we know, there are now two ‘official’ Food Banks in Cumbernauld. At its recent meeting the Kirk Session at Cumbernauld Old agreed that we should encourage the congregation to help our local community by contributing to these banks, run by the Salvation Army and Cornerstone Christian Fellowship. Most of the goods needed are tinned items (e.g. mince, ravioli, stew, peas, beans, etc.) and we hope to have a full list available next week or soon thereafter, and place a box for donated items at both the Parish Church and Forge Community Centre from Sunday 9th March. We’ll keep you posted with further details once they are available.